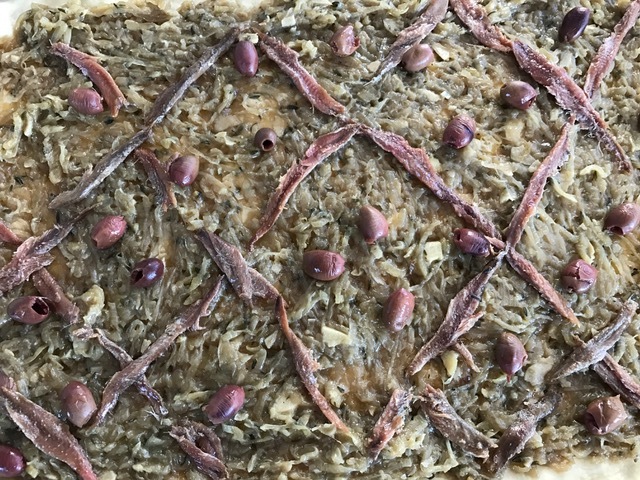 This week’s recipe for Cook the Book Fridays is for an easy appetizer called Pissaladiére, or Onion Tart. Talk about something that’s bigger than the sum of its parts. This recipe starts by making an easy yeasted dough, similar to a pizza dough. 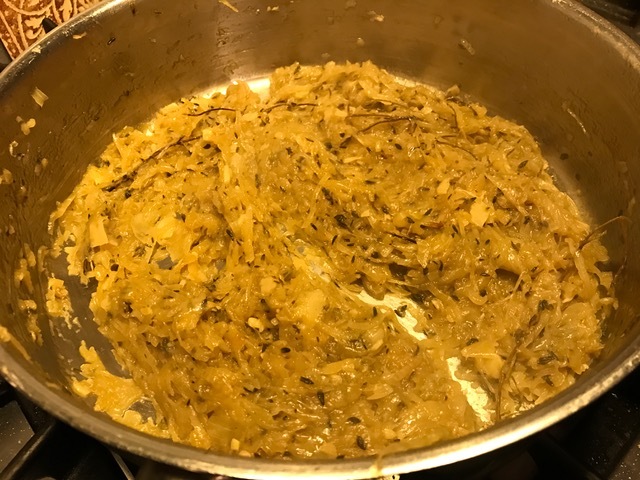 While the dough rises, a huge pile of onions gets caramelized. In theory, the timing works out nicely. The dough should be ready to stretch out around the time the onions have the proper golden hue. Unfortunately, I had a scheduling hiccup. I got a late start, and when the onions were done, I didn’t have enough time to stretch and rest the dough, arrange the toppings, and bake, before I had to leave the house. Disappointed, I put the onions and rising dough in the refrigerator, hoping for better luck the next day. I knew the onions would be fine but not as confident about the dough. Next day, I approached the refrigerator with trepidation. 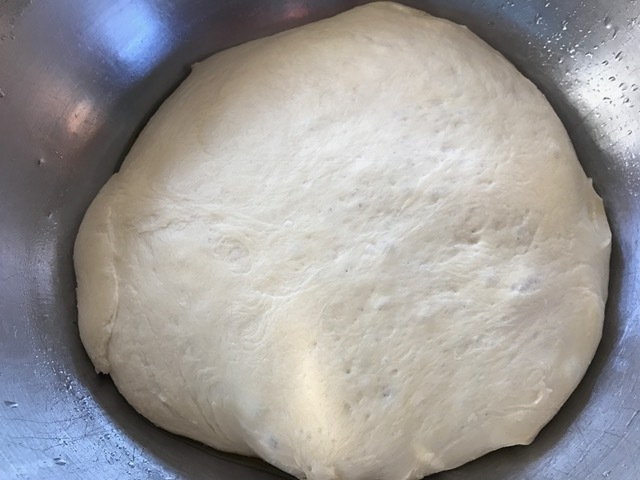 I was surprised and delighted to find that the dough had continued to rise overnight. I feared the dough would be a lost cause, instead, I discovered that this recipe was more flexible than I expected. I let the dough warm up for about an hour, then continued with the recipe. The dough patted out easily to fill the pan. 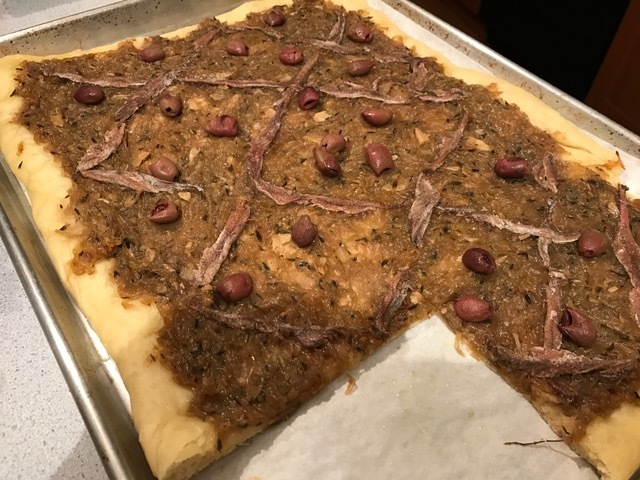 I spread the caramelized onions on top, then had fun arranging anchovies into a crosshatch design and strewing the top with olives. The pissaladiére is in the Appetizer chapter, but I found it worked well for lunch with soup. It was delicious! And, I also really loved figuring out that I can make the pizza dough the day before. Definitely try this one. You won’t be sorry. It’s a winner. You can find the recipe on page 69 of David Lebovitz’s My Paris Kitchen. To read my blogging friends’ links about their own experiences with this recipe, check them out here. 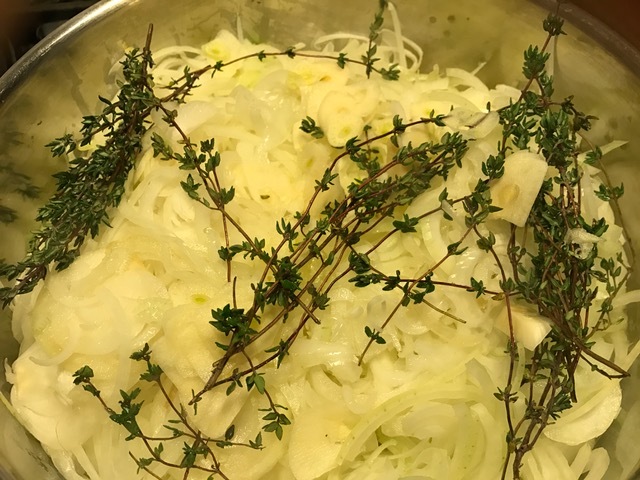 Posted on 16 December 2016, in Cook The Book Fridays, my paris kitchen and tagged Cook The Book Fridays, my paris kitchen, onions, tart. Bookmark the permalink. 9 Comments. That’s really good info to know about the dough being fine if it sits in the fridge overnight! I agree this made a nice lunch with a salad! This is helpful information that should be part of the recipe. I should update my post to reflect that, so I could have another good alternative working this recipe. Thanks so much! Looks nice Betsy. Love the dough! I loved this one too! I store pizza dough overnight in the fridge all the time; it’s works really well. to know that we can make the dough ahead of time. Your tart looks great Betsy. Way to go and nice to know that even with hiccups, a recipe can come out well. I think Pissaladiére plays together with any type of drink, wine, cocktail or beer. But, soup is a new one and sound delicious to me. Nice. Love the crosshatch pattern you made (I tried too but mine did not come out nicely!). Love your tip for pairing it with soup! The dough is a keeper recipe for me, so easy, and I made mine by hand. I served my hubby’s non-anchovy version with the grated carrot salad! This is a winner alright! We love it too! Delicious! That’s great that the dough worked so well overnight. So much easier, if you don’t have the whole day available. I loved the flavour of this tart and the crust was delicious. I’m going to try the crust in other applications.